PETsys Electronics was listed among Medical & Health IT and one of the top 25 Portuguese emerging start-ups for 2018 in the Scale-up report. This dynamic Scale-up report is a ground-breaking study of the top 25 emerging Start-ups in Portugal, selected by considering the total funding received and total revenues of all start-ups with Portuguese origin, with less than 5 years of operation (i.e. between 2012 & 2017). Seven PET scanner prototypes are being built, with PETsys technology, by five companies, some of which have already decided to adopt PETsys technology. Customers in 4 continents: America, Europe, Asia and Australia (location map availlabe). PANDA experiment uses PETsys Electronics. The PANDA experiment at the future Facility for Antiproton and Ion Research (FAIR) requires excellent identification of subatomic particles. For this purpose, a Detector for Internally Reflected Cherenkov light (DIRC) is being developed at the University of Gießen. The working principle is based on detecting single photons by Microchannel Plate Photomultiplier Tubes (MCP-PMTs). Because of the high time resolution, small form factor and scalability, the PETsys TOFPET ASIC was chosen as the favored readout option. The current prototype setup which was recently tested at CERN used more than 1000 channels. The final detector will consist of 28,800 channels. The new ASIC (TOFHiR: Time-of-Flight at High-Rate) design, engineered by PETsys Electronics for CERN, was delivered in July 2018: TOFHIR ASIC will be used in the CMS MIP Timing Detector (LYSO timing layer of the CMS experiment) at CERN. ASICs delivery: PETsys ASIC BGAs delivery, started for Industrial PET prototypes. PETsys ASIC and Electronics selected for Industrial PET prototypes. PETsys ASIC2 demonstrator project, supported by Portuguese (PT 2020) and European (ERDF) authorities, was executed with success. Demonstrator Project TOFPET2 ASIC - High Performance ASIC for Time-of-Flight PET, funded by PETsys Electronics SA, PO Regional Lisboa, PORTUGAL 2020 - Sistema de Incentivos a Investigação e Desenvolvimento Tecnológico (PT 2020) and FEDER (ERDF) - European Comission (Projecto Demonstrador 17665). CERN chooses the ASIC developed by PETsys Electronics and ordered the development of the new ASIC (TOFHiR: Time-of-Flight at High-Rate) for the CMS MIP Timing Detector (LYSO timing layer of the CMS experiment). PETsys Electronics was listed first among Medical & Health IT and one of the top 25 Portuguese emerging start-ups for 2017 in the Scale-up report. This dynamic Scale-up report is a ground-breaking study of the top 25 emerging Start-ups in Portugal, selected by considering the total funding received and total revenues of all start-ups with Portuguese origin, with less than 5 years of operation (i.e. between 2011 & 2016). PETsys' Talks at IEEE 2017 in Atlanta: "Experimental characterization of the TOFPET2 ASIC" and "PETsys readout solution for large numbers of photo-sensors"
PETsys Electronics participated actively at the IEEE NSS-MIC 2017 conference (October 2017), in Atlanta, Georgia, USA. - PETsys readout solution for large numbers of photo-sensors, presented in the industrial session. Sibylle I. Ziegler's team from Technische Universität München Nuklearmedizinische Klinik und Poliklinik, presents excellent performance results obtained in a preclinical PET/MR based on PETsys TOFPET1 ASIC, in an oral presentation at the IEEE NSS-MIC meeting in Atlanta (2017). The results were also submitted to Physics in Medicine & Biology: PET Performance Evaluation of MADPET4: A Small Animal PET Insert for a 7-T MRI Scanner, Negar Omidvari, Jorge Cabello, Geoffrey Topping, Florian Schneider, Stephan Paul, Markus Schwaiger and Sibylle I. Ziegler. Tahereh Niknejad, a PhD. student with a grant sponsered by PETsys Electronics, received the price for the best poster at the 14th International Conference on Scintillating Materials and their applications in September 2017. Tahereh presented a poster showing how the proprietary DOI (Depth of Interaction) scheme of PETsys Electronics can be used to improve the time resolution in realistic PET detector modules. New PETsys TOFPET2 ASIC was LAUNCHED and is now available. PETsys Electronics got the third "SEAL OF EXCELLENCE" from the European Commission. The Certificate was delivered by the European Commission, to the project proposal ClearPEMplus, Next generation detectors for high-resolution Positron Emission Mammography, submitted under the Horizon 2020’s SME instrument phase 2, in January 18, 2017. PETsys Electronics got the second "SEAL OF EXCELLENCE" from the European Commission. The Certificate was delivered by the European Commission, to the project proposal NextPETplus Next generation light sensors, based on Silicon Photomultipliers, for use in Positron Emission Tomography, submitted under the Horizon 2020’s SME instrument phase 2, in October 13, 2016. PETsys Electronics SA negotiated a follow-on investment agreement with Portugal Ventures. PETsys Electronics was selected by a distinguished Road2WebSummit judging panel to showcase at WebSummit 2016. PETsys Electronics got the "SEAL OF EXCELLENCE" from the European Commission. The Certificate was delivered by the European Commission, to the project proposal NextPETplus-Next generation light sensors, based on Silicon Photomultipliers, for use in Positron Emission Tomography and other gamma detection applications, submitted under the Horizon 2020’s SME instrument phase 2, in June 15, 2016. PETsys ASIC2 demonstrator project launched with support from Portuguese (PT 2020) and European (ERDF) authorities. PETsys Electronics was selected as one of the Top 25 Award Winners of the European Venture Contest. Over 100 investors and business angels chose the Top 25 emerging companies of the 2015 European Venture Contest at the continent’s biggest venture market place, the European Venture Summit (EVS). 100 European Venture Contest finalists from Europe Unlimited’s 2015 forums were invited to pitch at the EVS and the Top 25 were awarded. PETsys TOFPET2 ASIC announced for 2016. PETsys is developing a new version of the TOF PET ASIC with improved characteristics (TOFPET2). PETsys Electronics SA signed an investment agreement with Portugal Ventures. PETsys Systems created a new company – PETsys Electronics SA - to focus on gamma ray Detectors for next generation PET scanners. PETsys Systems: Clinical trials done at Timone Hospital in Marseille, France with the 2nd PETsys PET prototype, proved the validity of PETsys PET Technology. PETsys Systems: 2nd PETsys PET prototype, at Timone Hospital in Marseille, France got the necessary certification to start clinical trials in breast cancer. PETsys Systems: R&D development of SiPM based PET technology started under the framework of a research project funded by the 7th FP of the European Union. PETsys Systems: 2nd PETsys PET prototype, now with Ultrasounds technology incorporated, was produced and shipped to the Timone Hospital in Marseille, France for clinical research in breast cancer. PETsys Systems: The combination of currently owned PET technology with MR (Magnetic Resonance) started to be developed by PETsys. PETsys Systems: First stage of clinical trials have started with the 1st PETsys PET prototype. PETsys Systems: Clinical trials preparatory phase started in Portugal with the 1st PETsys PET prototype. A 2nd PETsys PET prototype was assembled to be combined with ultra-sound at the university hospital of Marseille, France (PETsys technology was chosen by CERN). PETsys Systems: PETsys – Medical PET Imaging Systems SA was founded, by 5 institutions as a result of an extensive R&D effort, started in 2003 (PET-Mammography projects). 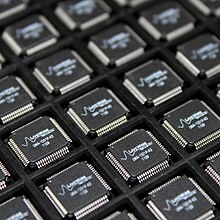 An application-specific integrated circuit (ASIC) /ˈeɪsɪk/, is an integrated circuit (IC) customized for a particular use, rather than intended for general-purpose use. For example, a chip designed to run in a digital voice recorder or a high-efficiency Bitcoin miner is an ASIC. Application-specific standard products (ASSPs) are intermediate between ASICs and industry standard integrated circuits like the 7400 or the 4000 series. As feature sizes have shrunk and design tools improved over the years, the maximum complexity (and hence functionality) possible in an ASIC has grown from 5,000 gates to over 100 million. Modern ASICs often include entire microprocessors, memory blocks including ROM, RAM, EEPROM, flash memory and other large building blocks. Such an ASIC is often termed a SoC (system-on-chip). Designers of digital ASICs often use a hardware description language (HDL), such as Verilog or VHDL, to describe the functionality of ASICs.